“Review: Borders, Barriers, Walls” by Julie Ewington, ArtAsiaPacific, Issue 100, p. 151. September/October 2016. 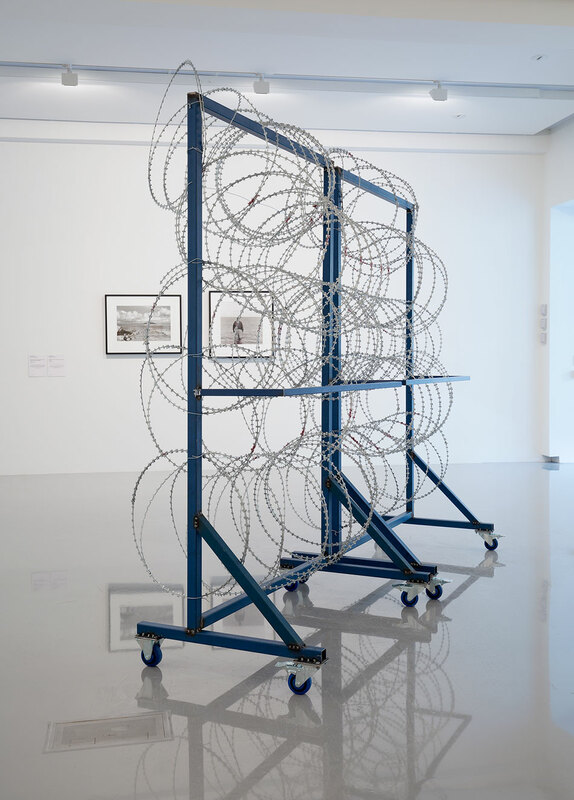 “Borders, Barriers, Walls review: Dark partitions share uncanny resemblance in MUMA show” by Robert Nelson, review of The Least of the Doorkeepers at Borders, Barriers, Walls, Sydney Morning Herald. 3 May 2016. “More Mofo Provocations” by Andrew Harper, review of No More Public Space, Only Public Order (Water Cannon), RealTime, issue #131. February-March, 2016. “A Performance Satirizes the Policing of Public Space” by Gretchen Coombs, review of No More Public Space, Only Public Order (Water Cannon), Hyperallergic. 26 January, 2016. “Kate Miller-Heidke and the TSO to close Mofo festival on a high note” by Jennifer Crawley and Roger Hanson, coverage of No More Public Space, Only Public Order (Water Cannon), The Mercury. 18 January, 2016. “Beneficence and Contemporary Art: When Aesthetic Judgment Meets Ethical Judgment” by Barbara Bolt, discussion of Nothing to See Here (Dispersal), Visual Methodologies, vol. 3, no. 2, 2015. “Review: The Melbourne Art Fair, Australia“, review of Closed to the public (protecting space) by Pip Wallace, Ocula. 20 August, 2014. “Underbelly Festival 2013 (Cockatoo Island)”, review by Kate Hennessy, The Smallest Room. 6 August, 2013. “Underbelly Arts on Cockatoo Island”, Catherine Ryan interviewed by Caitlin Gibson for So Hot Right Now on 2SER. 27 July, 2013. Recorded in Sydney, NSW during Underbelly Arts Festival. (Interview starts at 3:33). Borders, Barriers, Walls, Monash University Museum of Art, Melbourne, Australia. 2016. Während der Austellung ist das Museum Geschlossen, Museum für Neue Kunst, Freiburg, Germany. 2016. Performing Public Art, edited by Gerald Bast, Peter Weibel and Herwig Steiner, de Gruyter, Vienna, Austria. 2015. Vantage Point, The Substation, Melbourne, Australia. 2013. “The Public /Private Questionnaire” by Nina Power, accompanying text for No More Public Space, Only Public Order (Water Cannon). 2016. “Read the Fine Print” by Gene Flenady, accompanying text for Nothing to See Here (Dispersal). 2014. “Lest we Forget; Let us Forget” by Ben Gook, accompanying text for Nothing to See Here (Removal of Sydney Harbour Bridge). 2013. “The Bridge’s Negative Image” by Timothy Chandler, accompanying text for Nothing to See Here (Removal of Sydney Harbour Bridge). 2013.